McFarland, titled McFarland, USA in, well, the USA, follows the Inspirational Disney Movie Formula right down to a title that begins with the letter M, but it competently meets the average bar set by its predecessors and raises it a little higher whenever it can. Carrying the bar through every minute of McFarland is the strong performance by Kevin Costner, who takes the true story of Coach Jim White and runs with it as grand star vehicle. Costner, fresh off a great performance in the similarly feel good Black or White, looks to be on the verge of his own Disney-ish McConnaissance as he offers a one-two punch of solid dramatic work. His wise, scraggly, and hearty coach is the stuff of Hoosiers lore, and he’s bound to be everyone’s dad’s hero of the year. He doesn’t waste a frame of the film. Costner gives a very lean performance, too, and appropriately keeps White humble and down-to-earth as the coach moves his family to McFarland, California after he commits a major no-no worthy of Whiplash’s conductor Fletcher and gets himself fired. Jim moves with his wife Cheryl (a nice turn by Maria Bello) and their two daughters (Morgan Saylor and Elsie Fisher) to a neighbourhood that’s in a much lower income bracket than where they lived before. “Are we in Mexico?” Jim’s youngest daughter, Jamie, asks when she awakens in the car, and McFarland sets itself up to throw the sports movie into fish out of water territory a la Million Dollar Arm and Cool Runnings. Thankfully, though, the coach doesn’t play the White Knight. White’s ironic name doesn’t help his outsider status at McFarland high school where the student population is almost entirely Latino. White, who teaches PE, sees his students run laps after picking in the fields all morning before school and for hours after class so that they can help put food on the table for the family that moved to America from Mexico so that the kids could have a better life. The students (and their parents) call their teacher “White” (or “Blanco”) with a bit of endearment and defiance, but the coach sees that their energy and endurance needs a proper outlet. He therefore proposes the school’s first running team. These sons of Mexican immigrants can’t even afford proper shoes, so the odds of trumping the over-privileged students at the top-level schools at which White formerly coached seems daunting. It doesn’t help, either, that McFarland High sits across the street from a jail and the students run laps around some of their fathers and family members doing time. Fortunately, though, White sees the work ethic and family values in his students that was lacking in his former teams. Unsurprisingly, running provides a positive channel for their energy and empowers the runners. 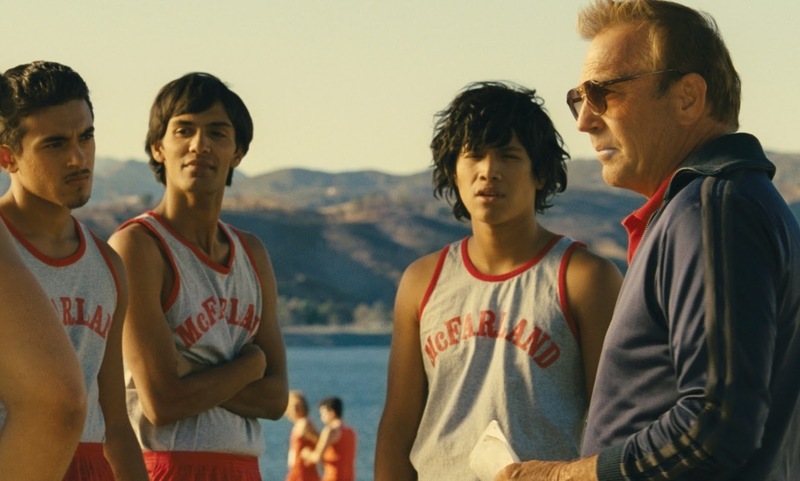 McFarland zooms in on one runner, Thomas (Carlos Pratts) who carries his family because his abusive father is currently in jail, and the film develops his relationship with the coach to reveal how the team provides structure and goals for the students. McFarland, however, does more than suggest that running puts the wind in the hair of White’s athletes and affords them a sense of power and freedom. The film takes audiences inside the homes of the students—the film makes a significant leap for a major studio film with a predominantly Latino cast—and sits Coach White down at the table for enchiladas. There’s a hint of the inevitable outsider comedy as Momma Diaz piles spoonful after spoonful of rice onto the coach’s plate, but McFarland uses the family gatherings as opportunity to draw the coach into the community and to let him observe the values that unite the town, his team, and, eventually, his own family. Director Niki Caro (Whale Rider) also takes the audience into the fields with Coach White as he picks alongside his students. She and Costner don’t play these scenes for comic relief; rather, the take a matter-of-fact and respectful approach to the physical energy one devotes to working in the fields. McFarland uses this sense of community and this salt of the earth work ethic to put White’s own values for work and life into perspective as he reshapes his approach for the team. Caro’s well-crafted races and running sequences put the skills of these students to the test as McFarland celebrates their drive and endurance with a terrific Latino-infused score by Antonio Pinto and warm cinematography by Adam Arkapaw and Terry Stacey, which evokes the heat of the fields and the McFarland community spirit alike, expands the horizon for the McFarland runners as they move up the ranks. McFarland never patronizes its subject, so even if the film wholly abides by the Inspirational Sports Movie formula as it runs towards its rousing ending, it feels very refreshing in this regard. McFarland is now playing in wide release.